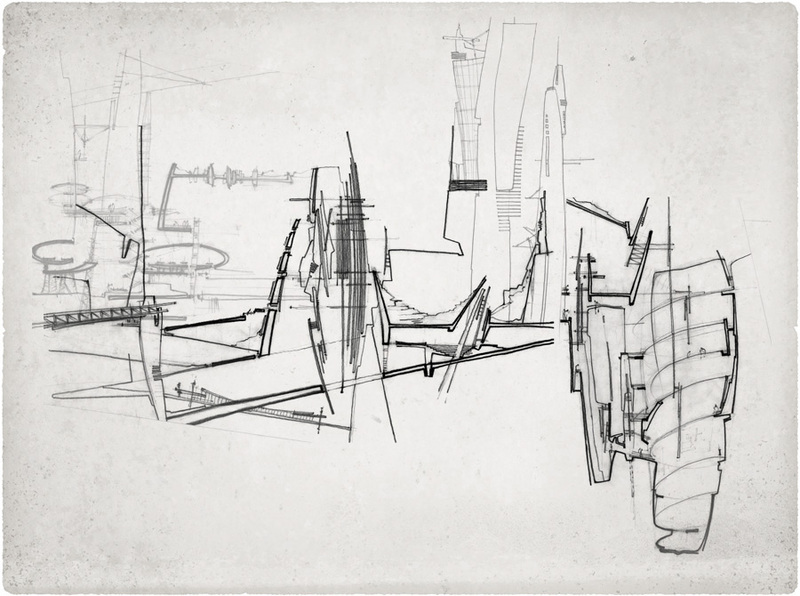 The major conclusion of my analytical thesis Potential Architectures was that the idea of the masterplan could be replaced by an architecture that would have embedded into its conception the potential to respond to urbanistic issues. Such architecture would be possible only through local interventions based on existing situations. The project for rebuilding the former World Trade Center site relies on the implementation of three structurally independent systems, which contain the main functions of the program: the memorial, the working area, and the commercial and cultural area. Each system refers to a particular layer of Manhattan: the street, the sky and the underground. 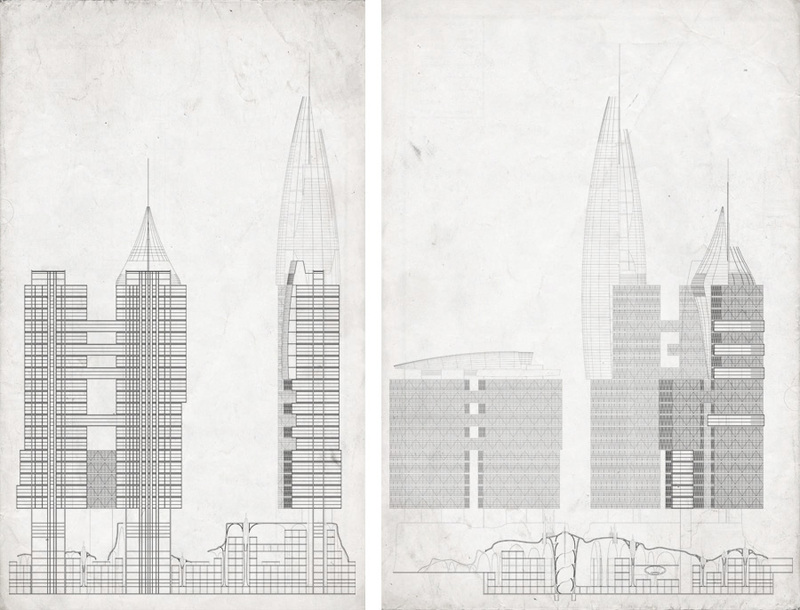 The three systems proposed are buildings, architecture capable to adapt to and deal with our ever-changing urbanity. The topography is a structure that becomes landscape and roof at the same time. It is not only strictly related to its location - the precise shape of the shell has no sense in a different location - but also to its time - before, the shape did not exist; after, the shape loses its meaning. 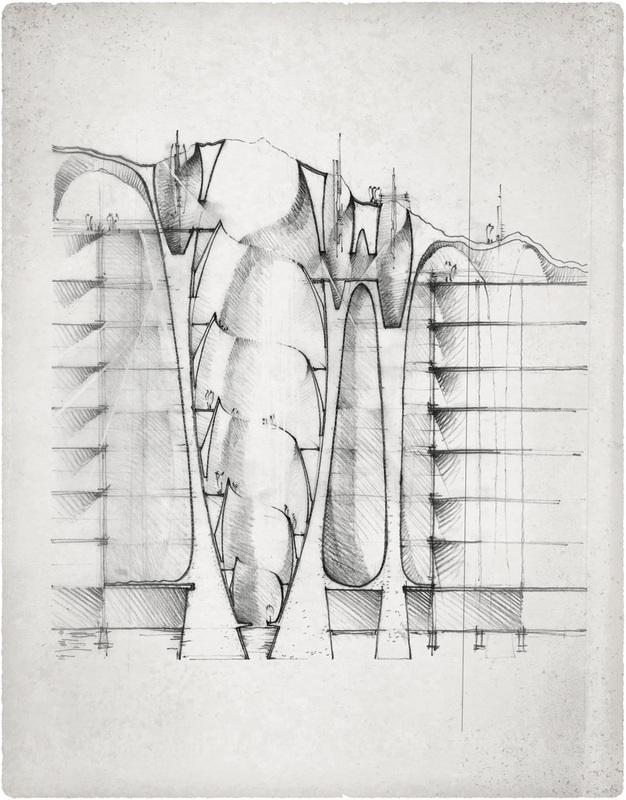 Thus the bi-nom time-space, on which potential architectures is based, it is the generator of the first architectural system: the topography. The two other systems are in effect buildings that support the urbanization of the memorial. 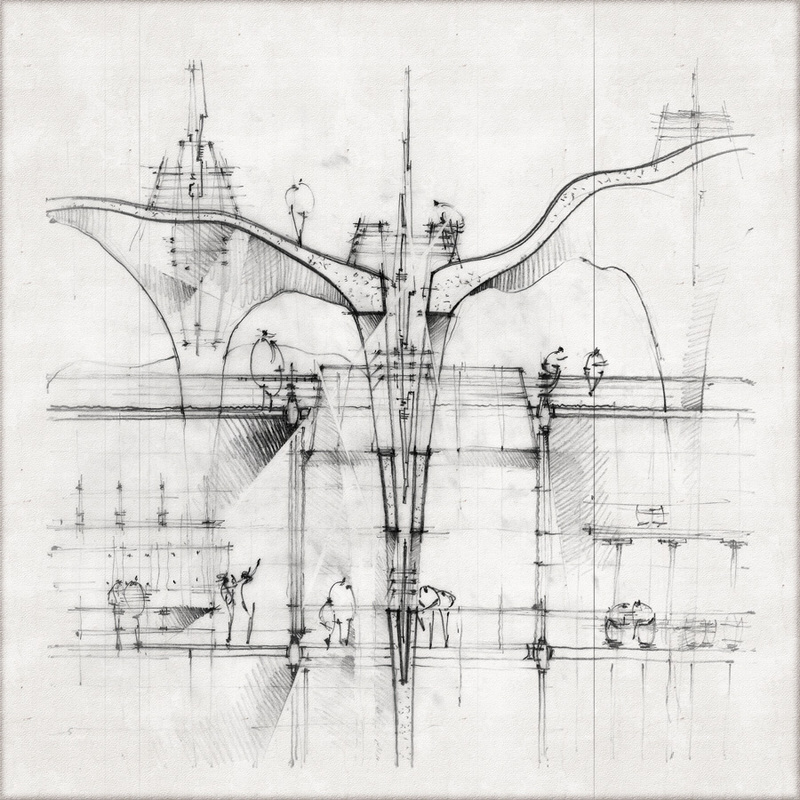 They interact with the topography responding at the same time to urbanistic issues. The grid building generates blocks when needed - along streets - instead of occupying the void left over by street layout. Also, in the case of the vast retail area, it is capable to fill the entire site creating an inside edge that will not affect streets continuity. Freed from the constraint of traditional blocks, the towers can be shaped freely without affecting the independency and the continuity of blocks. Potential Architectures for Lower Manhattan is a place of active memory, where every idea is kept safe beyond any principle of urban design. The Memorial introduces a new level of occupying urban space. 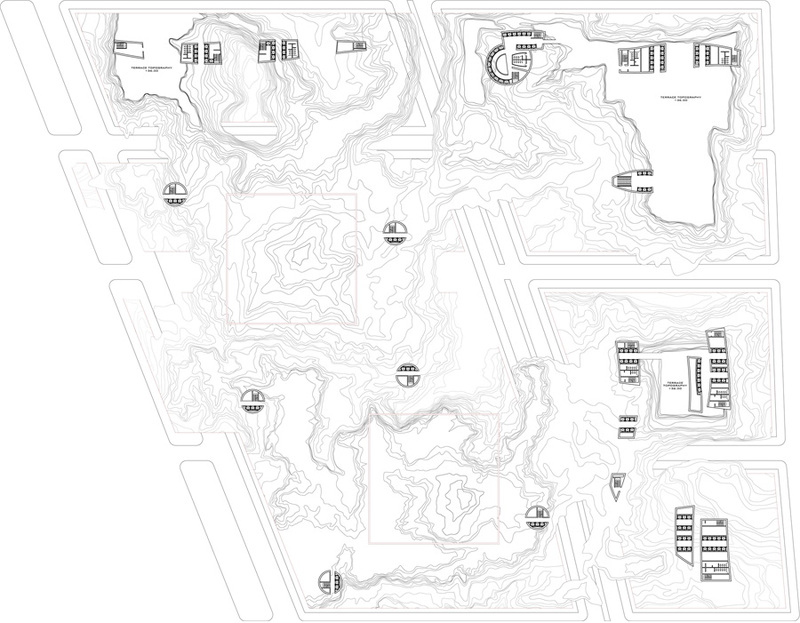 A concrete monolithic shell covers the entire sixteen acres of the site, replicating the topography of the aftermath. Thus the concrete shell becomes landscape and canopy at once. Once laid out, the shell starts to adapt to the existing conditions of the site. The partial restoration of the original grid - necessary to reintegrate and to reconnect the site with its vicinities - imposed alteration of the topography. All perimetral streets - Vesey, Church, Liberty, and West - slice the topography along their directions while the interior streets - Fulton, Dey, and Cortlandt - cut into the shell suffice to allow for traffic height. Being the major element of the site, the topography dictates the placement and the shape of the two other systems. 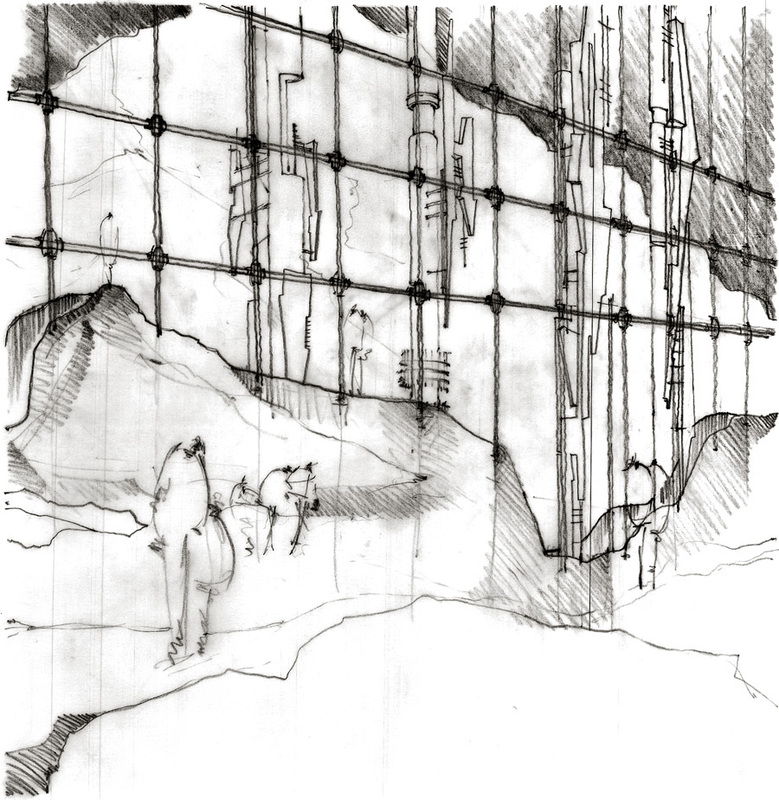 The grid shapes around the shotcrete columns, generating vertical spaces used as light courts. Each column becomes thus a generator of physical space as well as an originator of meaning by allowing the presence of the memorial within the gridded space. Based on a 6m module - 1% footprint - the grid consists of a sequence of adjacent steel boxes that occupy entirely the volume beneath the shell. 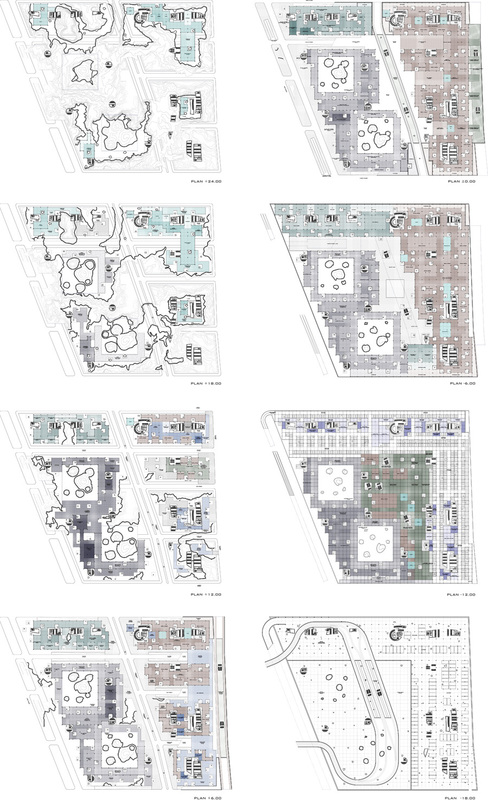 The grid accommodates a museum around the footprints, a conference center on the northern part of the site, retail spaces along the eastern limit, and lobbies for the new transit hub and for the towers. The grid makes room for horizontal circulation, restoring the original blocks at street level and generating an inside edge below. The grid also clears the space for two subway lines that cross the site from north to south: one along the restored Greenwich Street, and one along Church Street. Accesses from gridded spaces to the subways are given through vertical cores, similarly to the towers. The Path Station, which assures the connection of the site with New Jersey, is located at the last level and coordinates with all three structural systems. The towers are located along the northern and eastern extremities of the site, framing the two footprints. 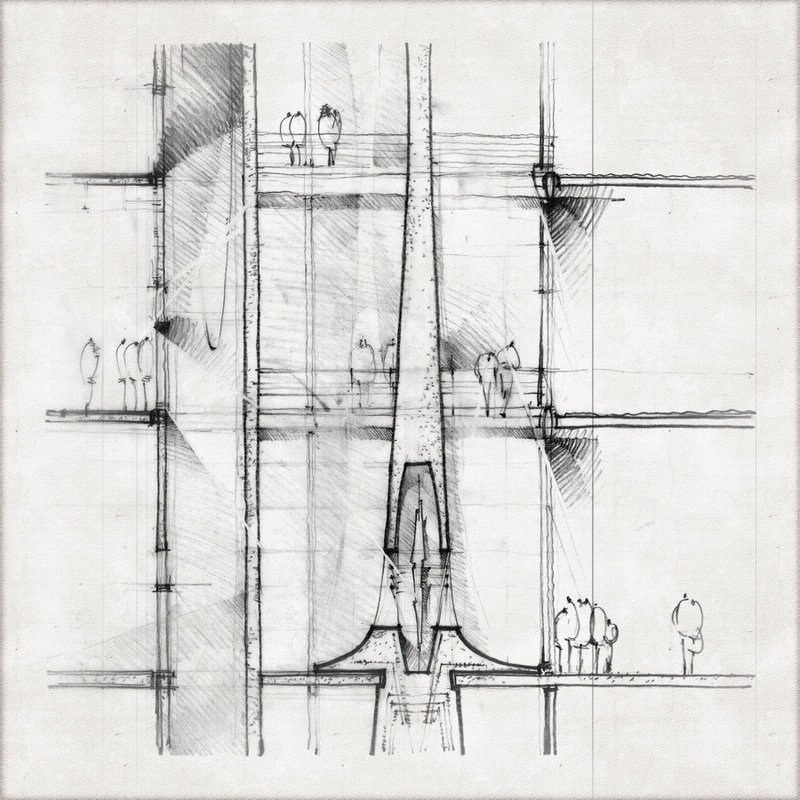 Fourteen concrete cores, comprising elevators, stairs, restrooms and service spaces, constitute the vertical structure of the towers. 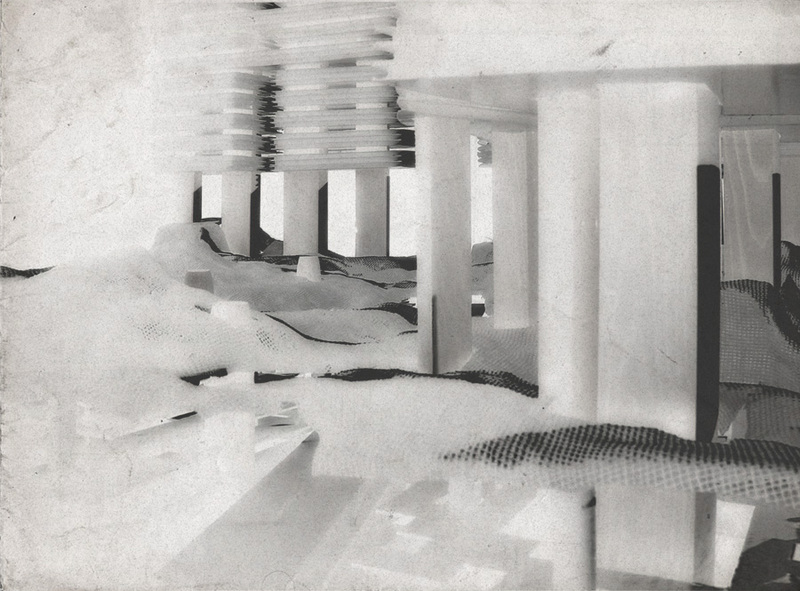 A series of girder-boxes, comprising three floors each, span between the cores, allowing for multiple ways of egress. The shape of each box responds to site conditions according to its elevation. The girder-boxes are straight on the perimeter - until the first setback of the adjacent existing building - and curved towards inside - embracing the area of the footprints. Moreover, the first setback of the adjacent buildings along the perimeter of the site, which corresponds to the code set back of Manhattan, coincides in elevation with the top of the shell, generating a horizontal plane that ties the buildings together. The last setback of Manhattan sets the beginning of public space within the towers, treated in a different language. The office space - girder-boxes - develops until the last level of the tallest adjacent building Liberty Plaza, while the public space - continuous external trusses - rises in the form of organic tops. Towers’ cores are placed along the highest points of the topography to allow the inhabitation of the topographic terraces - remains of buildings WTC 3, 4, and 5. Due to their irregular shape, the cores generate diverse kinds of vertical spaces within the gridded system. 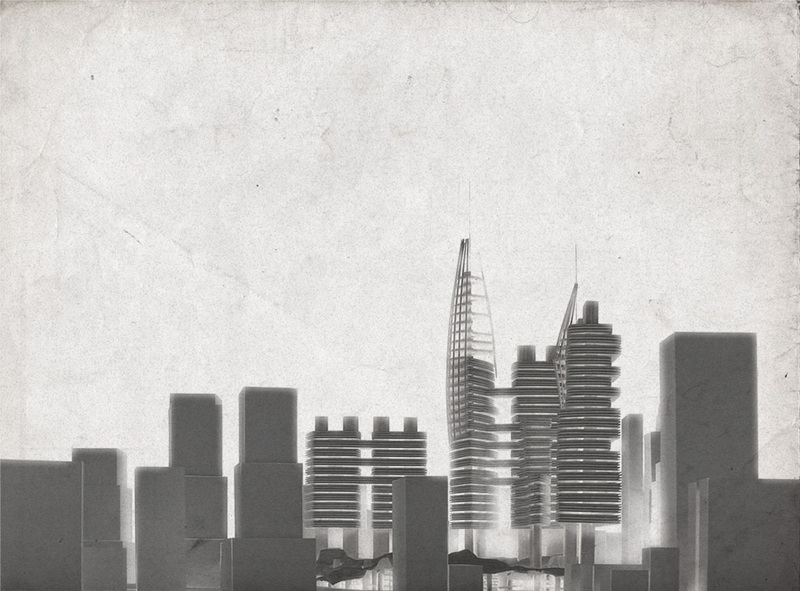 The public tops descend onto the towers - instead of being stacked onto them - as a result of topography’s presence. The influence of the memorial is present into the language of the tops as well as into their placement - inside the site. The only case in which the topography is altered by new systems is when the grid and the cores interact with each other. In this case, the void within the grid is extruded and creates hole into the shell to let the cores to rise to the sky.